On a slope of Mt. Makiling in this lakeshore town, Czarino shows his fellow fictionists attending a writers seminar-workshop blank prints of photos he had snapped during the opening ceremonies the day before. The 55-year-old poet and novelist finds it strange that no images appeared in the 36 exposures he did snap, taking shots for posterity of the annual workshop also attended by his only daughter, now in her 20s, who was still an infant when security authorities jailed him for what he says were trumped up charges. ”I think Maria Makiling was at work again yesterday,” Czarino tells his fellow writers, who included scholars, intellectuals, fictionists and performance artists, who all gathered at the National Arts Center overlooking scenic Laguna de Bay. Elsewhere in the province, some graduates of the Ilocos Norte National High School are having their own field trip in what has been dubbed a “learning tour” in different towns of the home province of Jose Rizal, courtesy of batch mates who now make a living in this town southeast of the metropolis. The batch mates – many have not seen each other in two scores since graduation – are visiting what residents call a historical landmark, the Nagcarlan Underground Cemetery. The graveyard is a circular wall structure, built in the 18th century by the Franciscan Missionaries, with an intricately designed wrought iron-gate on the red-tiled walk which crosses the grounds leading straight to the opposite side, where an altar-like structure is. The tombstones are embedded on the brick walls of the cemetery. At the crypt of the cemetery, is where the Katipuneros plotted against Spanish rule in the 19th century. The batch mates had earlier been to other towns – a rather tight two-day trip to other historical and natural attractions of the province like those in Liliw, Cavinti, Paete, Mabitac and San Pablo City, where a classmate earlier treated them to baskets of sweet lanzones and rambutan, (Nephelium lappaceum), a medium-sized tropical tree in the family Sapindaceae. They had also gone to, among others, the Hidden Valley Springs in Calauan, the Eight Mountains in Nagcarlan, and visited some of the Laguna man-made attractions, apart from testing the temperature in some of the hot springs that line the national highway from Calamba to this town. In San Pablo City, the batch mates, driving to Laguna for the first time, were a stupefied audience when their classmate told them about the seven lakes, nestled in a depression created ages back by volcanic activity. The seven lakes are: Sampaloc, Mojicap, Palakpakin, Calibato, Pandin, Yambo and the Bunot Lakes. Sampaloc Lake, the biggest of the seven lakes, is dotted by fish pens where tilapia, a local freshwater carp species, has its breeding zone. But if the high school graduates – already professionals in their respective callings – were an astounded audience in San Pablo City, the attendees at the writers workshop are as enthralled as those in San Pablo City. Particularly when one of the writers started talking about the profile of the sleeping Maria Makiling, a legendary goddess in Philippine mythology, which rises to 1,090 meters above sea level. 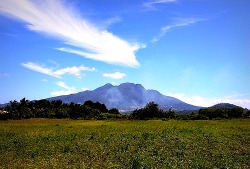 Legends surround the mountain, a popular hiking destination, many of which relate to Maria Makiling, said to be the 'guardian fairy' of the mountain. Maria Makiling, the fictionist tells his fellow writers during the break, while leafing through the blank exposures, is the guardian spirit of the mountain, responsible for protecting its bounty. Some stories suggest Maria Makiling is also a benefactor for people in the surrounding communities who depend on the mountain's resources, with some legends saying Makiling is a guardian of the mountain, identifying Laguna de Bay -- and the fish caught from it -- as part of its yield. There are people –- writers and others -– who say Mount Makiling resembles the profile of a woman, said to be Maria herself. One account says this phenomenon is described as true from several different perspectives, so there is no single location associated with this claim. The mountain's peaks are said to be Maria's face and two breasts, respectively, and her hair cascades downwards a gentle slope away from her body. The National Arts Center itself is the show window of Laguna, being an ideal vantage point for a panoramic view of the Laguna de Bay, the largest lake in the Philippines which has a surface area of about 911 square kms, with an average depth of about 2.8 meters and an elevation of about 1 meter. The lake is one of the primary sources of freshwater fish in the country, with its water draining to Manila Bay via the Pasig River. There is a superstition, re-narrated during the writers’ break, that every so often, men would disappear into the forests of Makiling. One story goes that Makiling fell in love with a particular man, and took him to her house to be her husband, there to spend his days in matrimonial bliss. Another superstition says that one can go into the forests and pick and eat any fruits one might like, but never carry any of them home. In doing so, one runs the risk of angering Maria Makiling. One would get lost, and be persistently harassed by insect stings and thorn pricks. The only solution is to throw away the fruit, and then to reverse one's clothing as evidence to Maria that one is no longer carrying any of her fruit.